The 2016 Premier League Darts season concludes on Thursday evening with finals night at the O2 Arena in London. Adrian Lewis, Gary Anderson, Phil Taylor and Michael van Gerwen will be fighting it out for the title of 2016 Premier League champion. Who will win? This article contains our betting preview on the Premier League Darts final night with free betting tips, predictions, enhanced odds, free bets and no deposit bonuses! Premier League darts final night : Betting preview Table-topper Michael van Gerwen aims to book his place in a fourth consecutive Premier League final by overcoming O2 debutant Adrian Lewis in the opening Semi-Final. MVG has been in sensational form so far, setting a new televised record average and embarking on a 15-match unbeaten run since the opening week of play back in early February. Van Gerwen recorded a 101.76 3-dart average in Hamburg last week but he still went out in the semi-final 6-2 to the event winner James Wade. As to the Premier League, the Dutchman enter the final night on the back of a 7-5 victory over rival Phil Taylor. Phil Taylor can reflect on an excellent season, finishing in second place in the Premier League table with 11 wins and the 2nd highest checkout percentage of any player. The Power will have to get past reigning champions Gary Anderson in the semi-final. Taylor will be very confident to reach the final as he has defeated Anderson 7-3 and 7-4 in their two meetings during the regular season. Adrian Lewis became the final man to secure a place in the Premier League play-offs after he beat PDC world champion Gary Anderson in Rotterdam last week. The 180s throwing of "Jackpot" has been non-existent in recent times. He didn’t throw any in his loss to Klaasen over the weekend and has only thrown three maximums in his last five Premier League matches – an average of less than one a match! The Stoke ace suffered successive defeats at the hands of Michael Van Gerwen in the league phase and has won just one of their last seven meetings in all competitions. Gary Anderson recorded eight wins and four draws in 15 matches on his Premier League campaign. He is aiming to become only the second player (behind Phil Taylor) ever to have successfully defended this title and also seal the feat of winning back-to-back World Championship and Premier League crowns. The Flying Scotsman enter the final night on the back of a heavy defeat to Adrian Lewis last week which only saw him hit two of nine attempts at a double. He also looked out of sorts in his match at the European Tour over the weekend so will need to rise to the occasion here to get past Taylor. 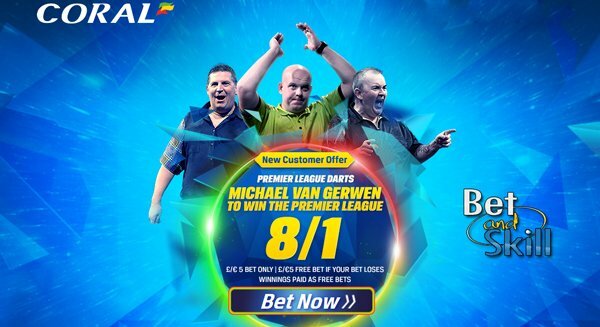 Price boost - 8/1 Van Gerwen to win the Premier League + £5 free! "Premier League Darts final night predictions, betting tips, odds and free bets (May 19, 2016)"